In the era of #MeToo, with advocates seeking to increase the representation of women in positions of power, one local PAC is taking the next step and working to support women running for office. 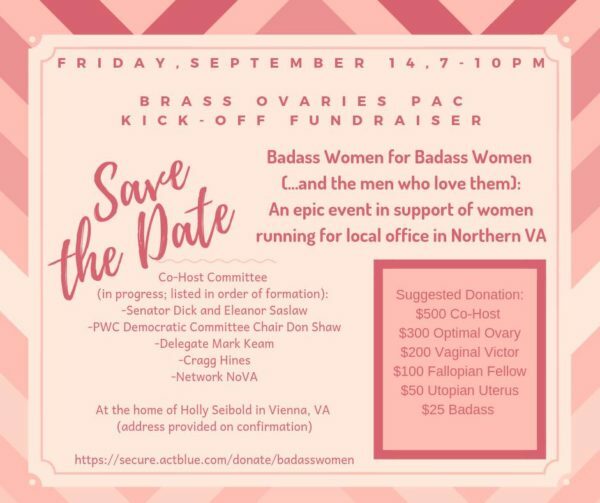 The Brass Ovaries PAC, founded by Democratic activist Gail Gordon Donegan, is raising money for first-time, female candidates. The PAC is launching with a kick-off fundraiser tomorrow (Friday) evening from 7-10 p.m. The event will be held in Vienna, with the exact address — a private residence — provided on confirmation at the event’s website. There’s a variety of donation levels, all of which come with thematic titles. The event will act as a meet and greet for a variety of local candidates, from town and city councils to the Fairfax County Board of Supervisors. Loudoun Chair Phyllis Randall, Del. Jennifer Boysko, Del. Mark Keam, state Sen. Chap Petersen, and Arlington County Board Chair Katie Cristol are all scheduled to attend as well. The PAC does not currently endorse candidates, instead focusing on providing seed money for women running for office. How much is distributed is dependent on how much the event raises.